College News explores the weird, wonderful and somewhat surprising travel destinations for 2018 that are drawing travelers in from far and wide. This year holds the possibility for new adventures, eye-opening experiences and unimaginable excitement. Take the first step and check out these travel destinations—you won’t regret it. The first of our travel destinations is Bolivia, a landlocked country bordered by Peru, Chile and Brazil. At present, it remains one of the most overlooked countries in South America—we are here to change that. It may be a little rough around the edges, but don’t let that fool you. This country has a wealth of natural splendor that is just waiting to be discovered. 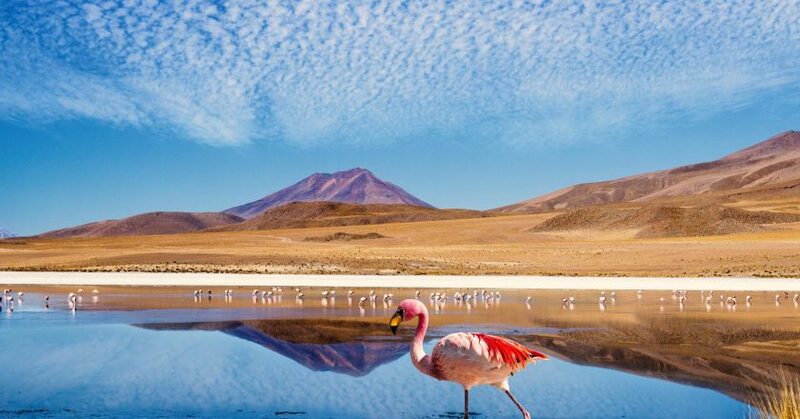 The diversity of Bolivia’s landscape is overwhelming: from the expansive salt flats of the Salar de Uyuni and the intricate network of floating islands on Lake Titicaca to the bustling capital La Paz and the dusty Andean desert region. Most tourists are blown away by the expressive culture displayed by Bolivians, with parades and deity-focused celebrations a common occurrence. Offering luscious forests, mountainous sites and colonial architecture, it goes without saying that Nicaragua is not to be missed. Nestled between Honduras and Costa Rica, this treasure trove of undeveloped land is perfect for travelers who crave to get off the beaten track. Nicaragua is also an ideal destination for activity junkies, which is why it features on our list of surprising travel destinations for 2018. Experience the ultimate rush of surfing down an active volcano, diving in underwater caves or fishing in the rivers of a dense jungle. The colorful colonial buildings of the towns and the pride of heritage displayed by the locals makes it a picturesque getaway for anybody in search of adventure. With almost half of its surface area being covered by forest, Slovenia is a dream for those wanting to reconnect with nature. This small country in central Europe is known best for its ski resorts, tranquil lakes and quaint coastal towns. A keenness for outdoor pursuits is a must when venturing to this particular travel destination, with hiking and cycling the snow-capped mountains being a favored pastime. Slovenia is also marked for its unique cuisine: an amalgamation of Italian, Austrian and Hungarian. There is a distinct focus on fresh and locally sourced ingredients. Aside from its natural beauty, most visitors remark on the supreme openness and hospitality of the locals. Japan encapsulates a harmonious balance between modern living and ancient tradition. Tokyo’s neon-lit cityscape is almost reminiscent of a science fiction film: a stark contrast to the rural prefectures elsewhere. Japan is a mecca for foodies; the flavor, simplicity and quality of the cuisine is synonymous the world over. Much to the surprise of newcomers, the gastronomy is deeply varied and largely dependent on the district. The mountainous regions offer up hearty hotpots while the coasts are famous for delicate sushi. Whether you choose to relax in some of its natural hot springs, visit a site of ancient shrines or take in the iconic views, there is something for everyone in Japan. This sliver of a country stretches along the western edge of South America, with around 6,000 kilometers of coastline. What Chile really is, is a land of extremes. In no other place could you stargaze the galaxies from the driest desert in the world—the Atacama Desert—climb the 2,000 meter Patagonian steppe of Parque Nacional Torres del Paine and visit the haunting moai monoliths of Easter Island in one trip. Even its cities have a distinct personality that resonates with tourists. Valparaiso is a key example of this: the city’s inextinguishable energy is brought to life through astonishing street art that is considered among the best in Latin America. Perhaps one of the most surprising travel destinations for 2018 is Bhutan—a tiny Buddhist kingdom on the eastern edge of the Himalayas. Bhutan is characterised by its preserved verdant landscapes, patchwork rice fields, magical fortresses (or dzongs) and impressive mountaintop monasteries. The Bhutanese make a point of restricting the number of yearly visitors—employing a sustainable approach to tourism, so as not to dent the environmental purity of their nation. Not only is Bhutan carbon neutral, but also at least 60 percent of its forests must remain for future generations by law. It comes as no surprise that such a place also measures their output by Gross National Happiness (GNH). Before embarking on a trip to Bhutan, a few rules and regulations should be kept in mind—mainly the daily tariff for foreign visitors. While this compulsory fee covers accommodation, food and guide, it also makes it a slightly pricier venture (one worth forking out for, we think). Which of these surprising travel destinations for 2018 would you visit and why? We want to hear about your plans for exploring the globe below!